Pamplin Media Group - A real page-turner! It's that time of year again to break out the hammock, grab a good book and lounge in the shade. 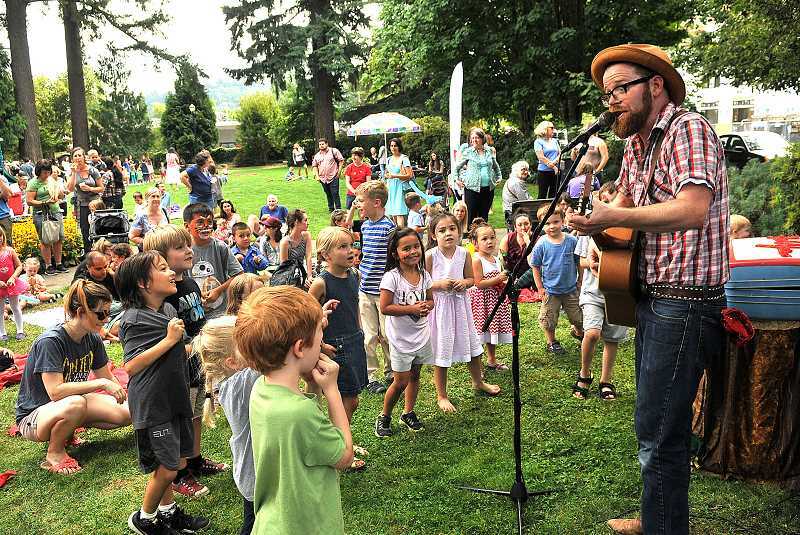 That's right: The Lake Oswego Public Library's summer reading programs for adults, teens and kids are back. Beginning June 1, every book that adult particpants read and log into the library's online system will give them a chance to win cool weekly prizes, like a $20 gift card to Chuck's Place or a $50 gift certificate to Powell's Books. Entries in the adult program also offer the chance to win a free stay at the Sylvia Beach Hotel in Newport's historic Nye Beach neighborhood, including dinner for two. The annual adult program, wittily named "Lazinfest" — derived from the German word "lesen," meaning to read — aims to get parents and other adults in Lake Oswego to set an example by picking up a good book and showing the kids how it's done. "People love free stuff, but what's really cool is the parents who read to set a good example for their children," says Kiira Taylor, a Lake Oswego librarian. "I've been a librarian since 1982, and it feels really good to be in a community where people appreciate education and continuing education and libraries." Taylor encourages adults — parents or otherwise — to participate in the program. Turns out that reading isn't just fun; it's actually really good for your brain. Reading can help heighten the brain's connectivity of the temporal cortex, which is linked to visual memory and language comprehension. It can also improve the way the different parts of the brain communicate, as well as increase readers' attention spans. And as it stands now, participants have a good chance of winning at least one weekly prize, Taylor says — although she's hoping to grow the adult program's numbers this year. Meanwhile, the library's summer reading programs for kids and teens also kick off June 1 and run through Aug. 31. Kids in grades K-6 who read for at least 20 minutes a day for 25 days will receive a free book. When they register for the program in the library's Children's Room, they'll also get a pass for free mini golf, a Portland Thorns soccer game and a Friends of the Library Booktique coupon. Those who complete their reading log also receive a complimentary Benihana kids meal, a complimentary Chipotle kids meal, an Oaks Park coupon, a coupon for a free Trail Blazers ticket, an Oregon State Fair ticket, a coupon for Lakeshore Learning Center and a $5 library fine voucher. And those who finish their reading log will be entered into a drawing for the grand prize: a ukulele from Lake Oswego's Fun Instruments. Teens in grades 7-12 receive a free book for signing up, along with coupons for Bullwinkles, the Portland Thorns or Timbers and Booktique. Every two hours of reading earns teens a raffle ticket for a $20 gift card to Bridgeport Village; after 15 hours of reading, they'll earn a free Blazers ticket, a Benihana appetizer, a 2-for-1 Chipotle coupon, free entry to the State Fair, a discounted ride bracelet at Oaks Park and a $5 library fine voucher. All teen summer readers who complete 15 hours of reading will also be entered into a drawing for the grand prize: a Portland Trail Blazers Family Pack. For more information about all of the programs — including a "Read to Me" program for kids from birth to age 5 — visit http://bit.ly/LOSummerReading.